Good oral health starts with brushing! Brush your teeth for at least 2 minutes twice daily using a soft bristle toothbrush or a Sonicare electric toothbrush. Use an ADA approved fluoride toothpaste of your choice. They all work about the same; so go for taste! Place the toothbrush on your teeth with bristles angled towards the gum line. Brush in a circular motion on the cheek side and a back and forth motion on the tongue side so that some of the bristles sweep under the gum line. The tooth structure under the gum line is the target to prevent gum disease. Slowly move the toothbrush around the mouth. Be systematic taking two teeth at a time. Start with the upper right and work your way to the upper left (This should take ~ 30 seconds). Then move to the inside of the upper followed by the outside and inside of the lower (A total of 2 minutes). The inside of the lower front teeth are the hardest to brush. 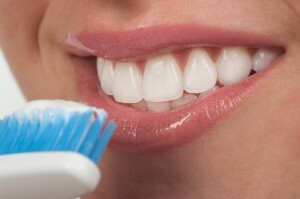 Tilt the toothbrush handle up by your nose and with firm pressure use the tip of the brush. Don’t forget to brush the tongue, cheeks, and roof of mouth. More bacteria are harbored on the tongue than on the teeth. It can help with halitosis (bad breath)! If you have questions or are concerned about your oral health, call Kalamazoo cosmetic dentist Dr. Brett Magnuson at 269-290-7275.